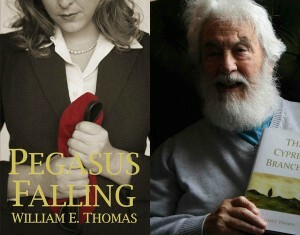 Today, Zohar from the excellent ManOfLaBook.com featured a guest post written by Mike telling the story of how Pegasus Falling came to be published. The story of how Pega­sus Falling came to be pub­lished is pos­si­bly as tragic as the story within its pages. William Thomas, my grand­fa­ther, was born in 1925. He started work as a mes­sen­ger at theBBC at the age of 14. When war broke out, he went to work with his father at a fac­tory in Har­row. While still a teenager, William joined the army and was soon recruited in to the Para­chute Reg­i­ment. By May 1945, he had been “dropped” in to a num­ber of key bat­tles and become a much dec­o­rated sol­dier. He was still only 19 years old. Fol­low­ing the war, he served in Pales­tine until 1948. William has six chil­dren. As they were grow­ing up, he was work­ing and study­ing in shifts as a mer­chant sea­man and an engi­neer. He was one of the first stu­dents to enrol at The Open Uni­ver­sity and in his mid fifties, he decided to work there full time as a lab tech­ni­cian, remain­ing there until his retire­ment in 1990. To continue reading the guest post on ManOfLaBook.com, and be in with a chance of winning an eCopy of the book, click here. To read Zohar’s 5* review of Pegasus Falling, click here.